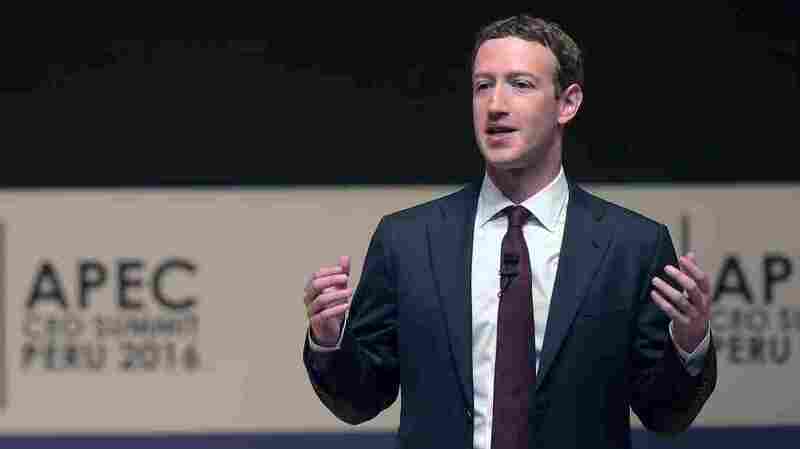 Mark Zuckerberg Addresses Fake News On Facebook Some have criticized Facebook for being a platform that allowed fake news to spread. Following the criticism, Facebook CEO Mark Zuckerberg released plans to combat fake news on the site. Some have criticized Facebook for being a platform that allowed fake news to spread. Following the criticism, Facebook CEO Mark Zuckerberg released plans to combat fake news on the site. Here's a headline for you - "Pope Francis Shocks The World, Endorses Donald Trump." That was the most shared story on Facebook during this election season according to a BuzzFeed investigation. Just one problem, it's completely fake, made-up, not true. And fake election stories like that were all over the internet. That's led to a lot of soul-searching for internet giants like Facebook. On Friday, Facebook CEO Mark Zuckerberg talked about ways the company might correct that problem while still allowing users to post whatever they want. To learn more, we turned to NPR media correspondent David Folkenflik. Hi, David. DAVID FOLKENFLIK, BYLINE: Hey, Linda. WERTHEIMER: So how big was the problem of fake news in this election season, do you think? I mean, how important was it? FOLKENFLIK: We don't exactly know. People from President Obama on down certainly have cited it as part of the - a melange of misinformation. Journalists, I think, increasingly were concerned about the sloshing of news stories that they had to in some ways counter as they spoke to people on the campaign trail out in various states, realizing that people's sources of information were no longer simply on TV, on the air, online and in print, but that they were awash in sources that were essentially designed to mislead them. You know, if we're in a world of ever-expanding media options, it's a tough thing to know how people are going to make good choices. WERTHEIMER: Well, Mark Zuckerberg seems to want it both ways. He hopes for more correct content, he says, but Facebook should not be arbiters of content, and people should still put anything they want to on Facebook. FOLKENFLIK: Well, until recently, I think he took an extremely disingenuous stance, which was that he said that Facebook was a platform but not a publisher. And if you think about Facebook's astonishing reach, you've got to salute their insights but also say, OK, with that, incredible audience comes responsibility. And so, you know, I don't think he gets to duck responsibility. At the moment, he's saying hey, you know, we're going to change our algorithms, we're going to figure out ways to flag things more readily, we're going to go with outside outfits that fact-check stories, perhaps like Snopes or PolitiFact or others, and also to strip out the economic incentive for companies that have popped up to do so. That is that there's a revenue-sharing program for content that proves to be viral. And Google and Facebook have, this week, said they're going to push a fake news sites out of that program. They don't want to reward them for what they're doing. WERTHEIMER: But still, there does seem to be an appetite for fake news. I mean, you would think that people would be more discriminating, that they would understand when they read this that it couldn't possibly be true. FOLKENFLIK: I think when they see it online or on Facebook they say it's on Facebook, good enough for me. That is the validation. I don't think people are being as discriminating as they should in saying consider the sources they once did. I think they're saying, well, Facebook, in some ways, provides a patina of validation and affirmation. And Zuckerberg only this week appears to have embraced that. WERTHEIMER: Where does that leave us? FOLKENFLIK: You know, the sad truth is I think that this leaves us with the responsibility not just to be consumers but to be citizens. You have to think hard about where you're getting news from. You have to see if they're doing their homework in public, that is if they show you how they reach the conclusions that they're reporting, if they create links to the original interviews or documents that they're basing these stories on and not simply whipping these up out of whole cloth. If you've never heard of a site, I think it matters in terms of your appreciation of whether or not to trust it. I think we need to be a lot more muscular as we consume information. Yes, it's on the Internet, but no, that doesn't mean it's true. WERTHEIMER: NPR's media correspondent David Folkenflik. David, thank you.